Rakusan did not include the Fan Series in his main sequence numbering. Therefore, the original number used for each of the 36 Series prints has been modified to identify the Fan Series members of its theme. The five different fan silhouette shapes have been here assigned arbitrary numbers 1 through 5. To indicate a fan design these shape designations are added to the 36 Series number separated by a hyphen. 133-5 is the Fan Series design with fan shape 5 in the 133 Clematis theme. Like all other designs in this series, 133-5 was only produced in a single print run, and few copies are currently documented. The signature and seal markings suggest that the designs in the 133 Clematis theme were produced in at least two stages. Two of the five fan designs in this theme and the 36 Series design 133 have seal C which indicates a carving date during the first half of 1934. Despite the early completion of some of its wooden blocks, Rakusan delayed printing and distribution of the prints in what became the 133 Clematis theme until the following year. It was eventually grouped with other summer season themes nearer to the end of the series. The other three fan designs (including 133-5) have seal B which suggests that those designs were carved closer to the time of publication. 133-5 is an original Rakusan composition, and only the style of the flowers and leaves (which most resembles that of 133-3) recalls TBS. The design shows a skimmer dragonfly sitting on the end of a bamboo stake. A few sprays of clematis vine with two flowers and two buds are below. The inclusion of a bamboo support for the vine indicates a garden setting. The dragonfly and the blossom parts are very finely scribed, and the rest of the elements are in a very loose, silhouetted style. The general name for all dragonflies is 蜻蛉, とんぼ, トンボ, tonbo, 'dragonfly'. This name is also used in a technical sense for members of the huge, cosmopolitan family Libellulidae which are often called skimmers in English. 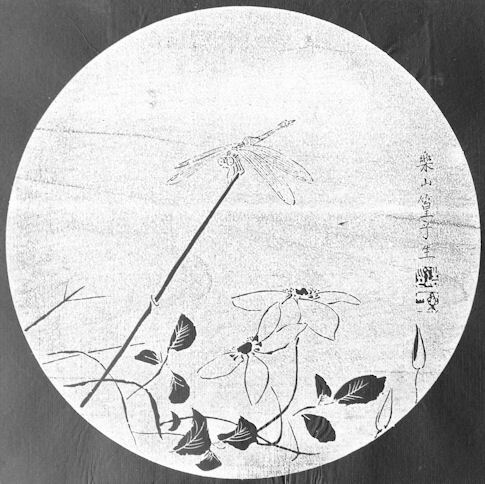 The only dragonflies Rakusan includes in any of his woodblock print designs are medium-sized skimmer dragonflies. Many Japanese species of skimmer dragonfly have transparent wings with a small rice-grain-shaped dark spot on the leading edge of each wing near the outer end. 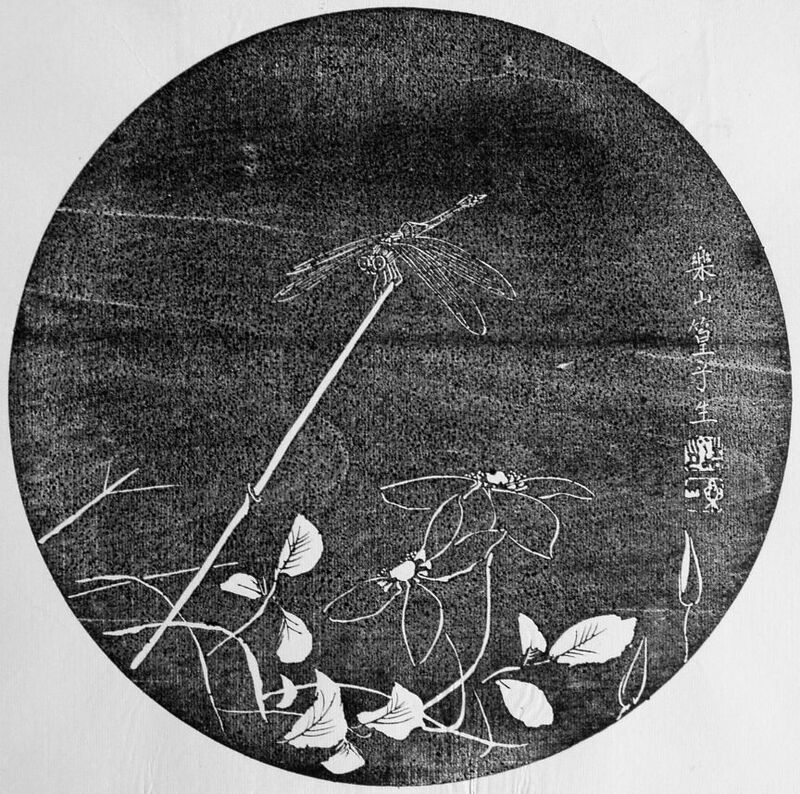 This feature can be seen in all of the Rakusan woodblock print images of dragonflies (including 133-5 where it is shown in outline only).